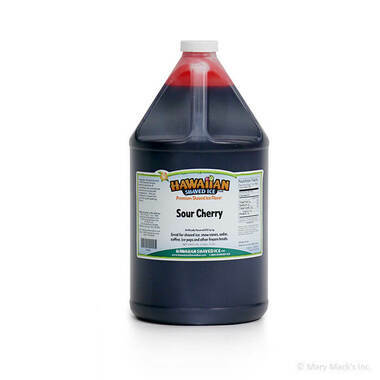 Hawaiian Shaved Ice has blended your favorite cherry flavor with an fun sour taste! 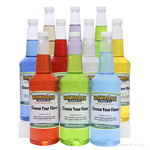 It tastes just like all those sour candies that you enjoyed as a child, and that your kids love now! Pucker up when you take a bite of this cherry snow cone, blasted with sour flavoring. Enjoy cherries like never before with this creation from Hawaiian Shaved Ice. Kids and adults will rave about the authentic flavor, and you might even think that you�re biting into an actual cherry, with a sour twist! Bite into this special treat and wake up your taste buds! 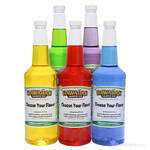 Grab a gallon of sour cherry sno cone syrup flavoring from Hawaiian Shaved Ice and let the fun begin. 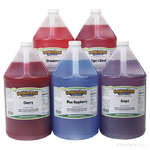 We also sell this flavor in quart sizes, if you�re looking for a smaller amount, or in the assorted packages, so you can add more of your favorite, mouth-watering flavors from Hawaiian Shaved Ice!